MDSGC supports hands-on learning opportunities and scholarships in higher education, professional development for educators, and public events to engage Marylanders in space science and engineering. MDSGC’s 2019 Summer Exchange program invites qualified students to apply for hands-on summer internships at any of the participating universities other than their home institution. The program will exchange successful applicants among participating universities for a 10-week paid engineering internship experience. Interested students should contact the faculty coordinator (see below) at their home institution for more information. The link to the application is at the bottom of this page. Please read this page carefully before applying! The application deadline is April 10, 2019. Rising sophomore, junior, or senior engineering majors. Note: some projects have prerequisites that may require particular experience. Currently enrolled at one of the following institutions: Capitol Technology University (CTU), Morgan State University (MSU), University of Maryland Baltimore County (UMBC), University of Maryland College Park (UMCP), or University of Maryland Eastern Shore (UMES). Interested in working at one of the participating universities other than their home institution. Example: CTU students should not apply for an internship offered at CTU through this program. Available to commit for at least 10 weeks during the summer of 2018. On the application, students will be asked to rank their top three choices of project, specified by “Project ID”, listed in the table below. Project Description: The intern will work as part of a team to inject problems into simulated satellite telemetry and study the effects. The student will learn and apply data mining methods to ingest telemetry data sets in real-time, predict anomalies, and develop algorithms for contingency response to ensure safe flight operations. Background: Spacecraft have many different subsystems that are often plotted on trends by flight operations teams to track system health. These systems are prone to failures and anomalies. Machine learning, more specifically neural networks, can be trained to diagnose spacecraft systems anomalies and even predict them based off of the systems status leading up to the anomalies. CTU's Hammers Corp. Galaxy simulator and SFOTC (Space Flight Operations Training Center) present a unique opportunity to research the effectiveness of machine learning in a real time spacecraft flight operations environment. (i)	Provide students with a practical experience in working with problems in live satellites. (ii)	Incorporate machine learning and data mining skills in trending analysis of spaceflight operations. (iii)	Enable students to learn and apply data mining methods to telemetry data sets for analysis and anomaly detection. (iv)	Enable students to develop data mining algorithms . (v)	Provide opportunity for the student to participate in writing a publishable paper based on this research. (vi)	Provide experience using systems engineering skills. (vii)	Provide opportunity to learn version control and modular documentation skills. (viii)	Improve analytical skills and learn a new skillset. This project aims to recruit one intern. Project Description: The intern will be offered a choice to work on one or both of the following projects. A. 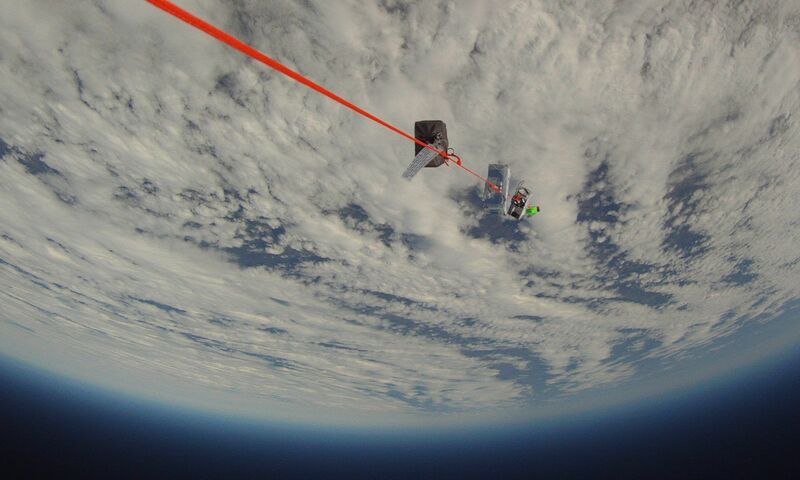 Long Distance Data Communications from High-Altitude Platforms: CTU will test and develop techniques to communicate securely with and receive high-speed data from platforms in near space (balloons). Software-defined radios (SDRs), antennas, engineering assistance, and funding for balloon launches will be provided by industry partners Draper Laboratories (www.draper.com) and APS Global. The goal will be to provide an encrypted communications link at high data rates over a line-of-site path of at least 200km using a small form factor device suitable for remote-sensing platforms such as UAVs, balloons, and satellites. The future of inexpensive remote sensing will depend on UAVs and other platforms that use secure communications and operate at high altitudes. Nasa’s Solar-Powered Pathfinder and Pathfinder-Plus (https://www.nasa.gov/centers/dryden/news/NewsReleases/1998/98-64_pf.html) are examples of sensor platforms that can attain high-altitudes that would require reliable high-speed data communications provided by a lightweight and robust system. The intern will assist with developing system specifications, PDR and CDR documents, and test plans. They will specify enclosures and other parts for 3D printing and assist with assembly and operation of test equipment. The intern will integrate the package with balloon platforms for test and launch and assist with tracking and recovery. B. Limitations and Security of LIDAR for Autonomous Systems: CTU will be receiving automotive-grade LIDAR systems from industry partner Draper Laboratories. Capitol will perform vulnerability analyses of the LIDAR to determine any issues that can be caused inadvertently, such as those caused by interference from other LIDAR emitters, and those resulting from intentional interference to degrade or mislead LIDAR output. LIDAR has the potential to provide high-resolution tracking for UAVs and other autonomous and human-guided systems. Little is known regarding vulnerabilities that may be revealed through extensive commercial use. With support from our partner, Capitol will perform structured tests to determine how well LIDAR systems will perform in congested environments and when faced with intentional misdirection and jamming. The intern will assist in developing test scenarios, designing/specifying/building test fixtures, developing test plans and parameters, updating test plans to address findings from earlier tests, and compiling results for analysis. The intern will assist with adapting standard cybersecurity techniques and procedures to address use cases for LIDAR. Project Description: The Space Flight Operations Training Center (SFOTC) enables students to operate a fleet of five simulated spacecraft operating in Low Earth Orbit (LEO), performing daily functions to manage spacecraft activities, monitor spacecraft health and safety and perform routine and emergency commanding. The center uses the A.I solutions Flight Dynamics FreeFlyer software to predict spacecraft location and when a spacecraft will be in view of a ground station. Due to the nature of the spacecraft constellation, multiple ground stations can be in contact with a spacecraft during a contact period. A proposed solution, the Spacecraft Live Station Monitoring (SLSS) system will be used in conjunction with the SFOTC Spacecraft Pass Operational Clock (SPOC) to provide realtime station status and provide students elevation / azimuth, Acquisition Of Signal (AOS) and Loss of Signal (LOS) for a spacecraft that is in view of a ground station and provide a visual display as to which ground terminal(s) are in view of a spacecraft. Desired Skill: The applicant should have a strong understanding of programing fundamentals. No prior programing language is strictly required, although experience in either ruby, java, python, bash, C or C++ is helpful. Student activities: The intern will learn the A.I solutions FreeFlyer Flights Dynamics software, will develop mission plans (scripts) for the Spacecraft Live Station Monitoring (SLSS) system to receive and process spacecraft orbital and attitude information, and will perform component and system level testing for the SLSS system and its integration into the SFOTC operational environment. Additional internship tasks will include performing a demo of the SLSS system to the Astronautical Engineering department, developing user documentation and creating a poster presentation on the SLSS system and its use in the SFOTC. Project Description: Liquid-propellant rockets are being studied and developed at Morgan under a funded research project. The first rocket under development will be a single-stage rocket to be launched to an altitude of about 13,000 feet. The intern will perform preliminary studies and design of the structural system using CAD software such as AutoCAD. The structure system will house the rocket engine, propellant fuel and other subsystems. The structural material and fabrication approach will also be studied. Project Description: Summer interns will work on designing, building, and testing engineering components of a high-power electromagnet that will be used for plasma physics research. Interns will also work on diagnostics that will be used to measure plasma parameters inside the magnet, including plasma density, temperature, and velocity. Testing of diagnostics will take place on the existing plasma chamber and low-field magnet at UMBC's Dusty Plasma Laboratory. The tools that summer interns will be using include SolidWorks, ANSYS Fluent and Maxwell finite element software, and MATLAB (or similar program) among others. A final report and presentation will be required from each intern towards the end of the internship period. This project aims to recruit two interns. Project Description: Research will relate to the use of robotics in space and factors pertaining to human operations in weightlessness. The Space Utility Vehicle (SUV) concept involves a single-person spacecraft equipped with both dexterous robotic manipulators and spacesuit arms for performing assembly, servicing, and maintenance on-orbit. The intern will help with design and outfitting of the internal controls and displays for an SUV proof-of-concept prototype, and will participate in human factors testing to assess the effectiveness of their design in performing realistic tasks from the Hubble Space Telescope and the International Space Station. This project aims to recruit one or two interns. Project Description: The Women In Engineering Office in the Clark School of Engineering at UMD will be running 5 summer camps in June and July this summer, and we are looking for summer interns who can help design engineering related activities for middle school through high school students, and then guide students through these activities during each of the week-long camps that we are sponsoring. In addition, the summer intern will become familiar with the undergraduate research that is being performed in the Space Systems Lab this summer, and will participate actively with the Balloon Payload Program team, which launches high altitude balloons carrying payloads into the NearSpace environment to take scientific measurements and perform engineering experiments. Project Description: The intern will work in a multidisciplinary team in both field and laboratory settings. While the project will be of interest to all engineering majors, the best match would be a student with interest in advanced software tools for data analysis and/or sensors and instrumentation for field experiments. The intern will be exposed to remote sensing efforts using small Unmanned Aerial Systems (sUAS) and design and development efforts for mobile robotic sensory platforms in water (Autonomous Surface Boat) and on the ground (Unmanned Ground Vehicle). Some familiarity with C, MATLAB and Arduino Microprocessor board will be valuable to the project team. If interested, the student can also support image processing and data analysis efforts using one or more of the following software environments: ArCMAP, PIX4D, SMS Advanced, MATLAB and SPSS. All of these efforts are integrated within the broad framework of Smart Agriculture and Automation efforts at UMES. The intern will get a broad exposure to all related project efforts and will be encouraged to choose a particular focus topic based on their interest and competencies. Project Description: The Robotics, Automation, and Mechatronics (RAM) laboratory and Control Systems Laboratory are in development in the new engineering building at UMES. These laboratories will be largely used for undergraduate instruction in courses such as robotics and control systems for engineering students. The laboratories will also support K-12 outreach and graduate research in the future. The robotics lab is equipped with state of the art industrial SCARA and six degree of freedom articulated robotic arm as well as other educational platforms such as Microbot Teachmover, IRobot Create2, Go Pi Go 2, and Phantomx Pincher robot. The controls lab has several electro-mechanical systems including a magnetic levitation device, ball and beam device, active suspension system, inverted pendulum and other mechatronic devices. The intern will work with the educational robotic devices and if logistics permit can be engaged with some of the instructional and demonstration efforts in the robotics lab for a 2-week long outreach effort that will be held in UMES in mid to late July or early August. Depending on interest and ability, the student may also work with the set-up of selected equipment in the controls laboratory. Some familiarity with MATLAB and Simulink software environment, CAD, 3-D printing and a broad interest in robotics and control systems will be beneficial. Junior/senior engineering majors who have already taken a course in control systems will be most qualified. The deadline for online submission of applications is April 10, 2019. (II) Completing the application requires (1) current student information including contact information and GPA; (2) a PDF resume or CV; (3) a PDF “statement of interest” (one page or less) that should explain your goals for the internship and your overall career; (4) contact information for one person who can provide a letter of recommendation; (5) your top three choices among the projects listed on this page. (III) Here is the link to the password-protected application page. Contact your home institution’s coordinator to request their endorsement and the password. MDSGC will provide a 10-week stipend of $7300 and will assist interns in arranging housing if needed. Interns will be responsible for paying housing and transportation costs out of their stipend. For general questions, please contact MDSGC. Visit our Contact Us page for directions to our offices, our shipping address and directory. MDSGC supports hands-on learning opportunities and scholarships in higher education, professional development for educators, and public events to engage Marylanders in space science and engineering. MDSGC is based at Johns Hopkins University and affiliated with Space@Hopkins.